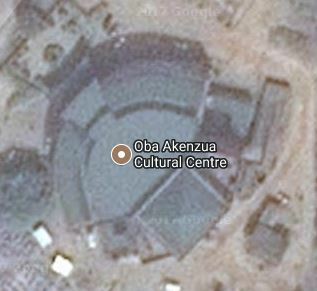 The Oba Akenzua Cultural Centre, designed by Nigerian artist Demas Nwoko, is centrally located in Benin City near the palace. Benin's premier venue for plays, video debuts, and other performances, it also hosts weddings, symposia, other social events, and occasionally serves temporary purposes, such as a mobile court..
Its exterior draws upon traditional Benin City aristocratic architecture in both color--an imitation of the local reddish clay in a cast sandcrete of Nwoko's own devising (a mix of cement, sand, and pebble-filled lateritic soil)--and in its horizontal ridges, a royal privilege the monarch grants many of his chiefs. Its shape, however, departs sharply from the rectilinear courtyard compounds of the Edo, favoring a semicircle that follows the curve of the theatre's seating. 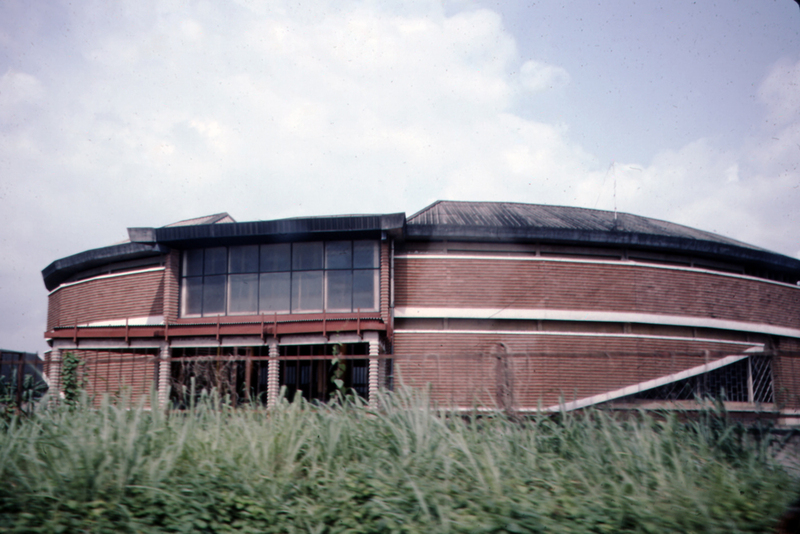 Nwoko originally designed the building as a University of Benin theatre in 1972, but it ultimately became a government-funded civic structure that opened in 1993. It seats between 200 to 700 people, depending on whether the forestage and orchestra pit are in use. The structure's two stories accommodate highly pitched seating as well as two roomy hallways sometimes used for exhibitions. Nwoko added exterior textural interest through window screening that alternates panels of vertically-oriented staggered rectangles with others consisting of diamond patterns. The staircase and select small areas of the exterior are enclosed by concrete openwork, and passive cooling aspects are incorporated, although the building is also air-conditioned. Nwoko developed a keen interest in architecture at an early age, and became familiar with Benin architecture during his secondary school days in Benin City. By the time he enrolled in the Nigerian College of Arts, Science and Technology in 1957 (subsumed by the newly-created Ahmadu Bello University while he was still a student), his direction had shifted to fine arts. His subsequent work included both painting and Nok-inspired terracotta sculpture. While at ABU, he became part of the Art Society, a group of students inspired by a will to integrate traditional arts with their Western-oriented training to create a kind of nationalistic authenticity. Nwoko's buildings remain some of the few major Nigerian structures that draw visible inspiration from earlier traditions within the country. Although he has been criticized by Nigerian architectural historians because of his lack of formal training as an architect, his buildings have received international attention. In 2017, Edo State's governor temporarily made the Centre the site of a motor park until a city-wide motor park could be constructed. A market has sprung up on the grounds to service passengers, and the grounds and structure have deteriorated. This may not be long-lived, for Oba Ewuare II called for its refurbishment during his announcement of the establishment of a Benin Royal Academy of Performing Art in 2017. Kathy Curnow, “Oba Akenzua Cultural Centre,” Bright Continent, accessed April 20, 2019, https://access.thebrightcontinent.org/items/show/7. Okoye, Ikem Stanley. "Architecture, History, and the Debate on Identity in Ethiopia, Ghana, Nigeria, and South Africa." Journal of the Society of Architectural Historians 61 (3, 2002): 381-396. Godwin, John and Gillian Hopwood. The Architecture of Demas Nwoko. Lagos: Farafina, 2007. Okeke-Agulu, Chika and John Picton. "Nationalism and the Rhetoric of Modernism in Nigeria: The Art of Uche Okeke and Demas Nwoko, 1960-1968." African Arts 39 (1, 2006): 26-37; 91-92. Le Roux, Hannah. "Modern Architecture in Post-Colonial Ghana and Nigeria." Architectural History 47 (2004): 361-392. Published on Aug 5, 2017. Last updated on Nov 4, 2017.